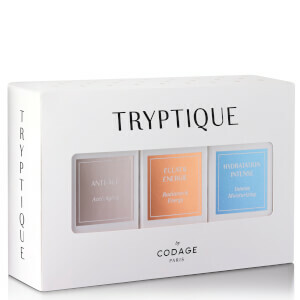 Formulated with French pharmaceutical expertise, CODAGE present the Tryptique Essential Serum Set. With a powerful blend of active ingredients, the radiance-reviving collection promises to moisturise and repair skin, whilst fighting signs of ageing and reducing the appearance of fine lines and wrinkles. 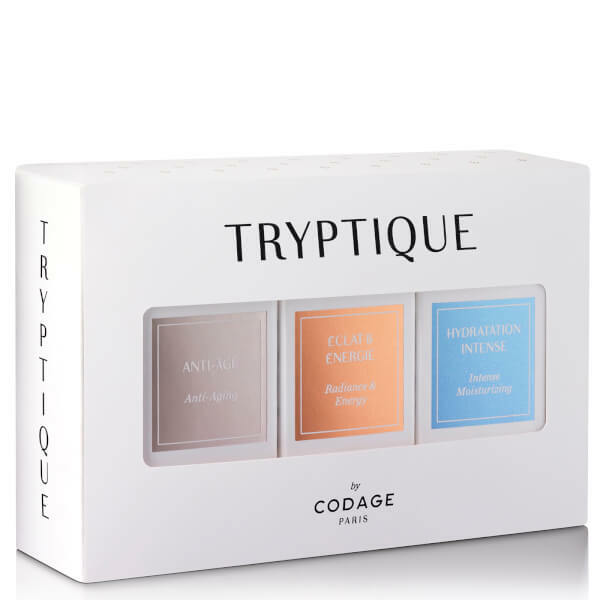 Deeply penetrating, the antioxidant-rich trio protect from environmental aggressors and reignite the skin's natural glow for a youthful-looking, invigorated complexion. E.N. Specially formulated for dry and dehydrated skin types, this serum nourishes skin to reveal a smoother, softer and radiant complexion. Infused with replenishing Hy3 to boost collagen production and plump skin for a younger-looking complexion. Hyaluronic acid relieves dry skin and provides instant moisture, whilst skin-soothing Ap2 delivers anti-inflammatory properties, helping to calm irritated skin and reduce sensitivity. Transform dull, lack-lustre skin with this fatigue-fighting serum. Fortified with Hy1, an ingredient that restores hydration and stimulates collagen production to plump and firm skin for a younger-looking complexion. Antioxidant-rich Ao3 protects skin from free radicals and UV rays, whilst a blend of anti-ageing ingredients smoothen the appearance of fine lines and wrinkles. Developed to repair and prevent signs of ageing, this moisturising serum delivers intense hydration to plump and tighten skin. Collagen-boosting Hy2 is combined with antioxidant agents to prevent and reduce wrinkle depth for a smooth, refined appearance, whilst component Ru3 firms sagging skin for a youthful-looking complexion. Serum N.01: Aqua (Water), Glycerin, Butylene Glycol, Erythritol, Acetyl Tetrapeptide-15, Sodium Hyaluronate, Hydrolyzed Hyaluronic Acid, Acetyl Hexapeptide-37, Diaminopropionoyl Tripeptide-33, Homarine Hcl, Plankton Extract, Caprylyl Glycol, Caprylhydroxamic Acid, Mannitol, Phenoxyethanol, Sodium Citrate, Methylpropanediol, Sodium Benzoate, Potassium Sorbate. Serum N.03: Aqua (Water), Glycerin, Butylene Glycol, Albizia Julibrissin Bark Extract, Hydroxyethyl Acrylate/Sodium Acryloyldimethyl Taurate Copolymer, Tripleurospermum Maritimum (Sea Chamomile) Extract, Diaminopropionoyl Tripeptide-33, Hydrolyzed Hyaluronic Acid, Ascorbic Acid/Orange/Citrus Limon/Citrus Aurantifolia Polypeptides, Retinyl Palmitate/Carrot Polypeptide, Acetyl Hexapeptide-37, Dipeptide Diaminobutylroyl Benzylamide Diacetate, Magnesium Aspartate, Plankton Extract, Acetyl Dipeptide-1 Cetyl Ester, Zinc Gluconate, Algae Extract, Tocopherol/Wheat Polypeptides, Lauroyl Lysine, Arginine Ferulate, Copper Gluconate, Dicaprylyl Carbonate, Erythritol, Homarine Hcl, Polyglucuronic Acid, Cyclopentasiloxane, Sorbitan Isostearate, Caprylyl Methicone, Dimethicone Crosspolymer, Caprylyl Glycol, Dimethicone/Vinyl Dimethicone Crosspolymer, Methylpropanediol, Dimethiconol, Laureth-3, Hydroxyethylcellulose, Polysorbate 60, Caprylhydroxamic Acid, Sorbic Acid, Phenoxyethanol, Potassium Sorbate, Sodium Benzoate, Disodium EDTA, BHT, Sodium Hydroxide, Parfum (Fragrance). Serum N.05: Aqua (Water), Glycerin, Butylene Glycol, Trifolium Pratense (Clover) Flower Extract, Tripleurospermum Maritima (Sea Chamomile) Extract, Diaminopropionoyl Tripeptide-33, Sodium Hyaluronate, Dipeptide Diaminobutylroyl Benzylamide Diacetate, Laminaria Digitata (Oarweed) Extract, Hydrolyzed Hyaluronic Acid, Palmitoyl Tripeptide-38, Zinc Gluconate, Erythritol, Acetyl Dipeptide-1 Cetyl Ester, Copper Gluconate, Plankton Extract, Magnesium Aspartate, Acetyl Hexapeptide-37, Homarine Hcl, Lauroyl Lysine, Sucrose Palmitate, Dicaprylyl Carbonate, Caprylyl Methicone, Hydroxyethyl Acrylate/Sodium Acryloyldimethyl Taurate Copolymer, Cyclopentasiloxane, Lecithin, Dimethicone Crosspolymer, Glyceryl Linoleate, Sorbitan Isostearate, Polysorbate 60, Hydroxyethylcellulose, Laureth-3, Dimethicone/Vinyl Dimethicone Crosspolymer, Caprylyl Glycol, Hydroxypropyl Cyclodextrin, Dimethiconol, Caprylhydroxamic Acid, Sorbic Acid, Disodium EDTA, Phenoxytehanol, Methylpropanediol, Tocopheryl Acetate, BHT, Citric Acid, Sodium Benzoate, Potassium Sorbate, Tocopherol, Parfum (Fragrance).